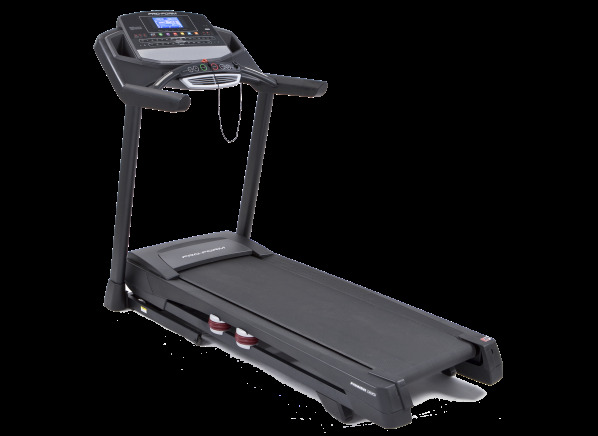 This ProForm is a budget folding treadmill It requires an area of 82 x 35.5 inches to set up. The maximum specified user weight for this machine is 350 lbs. The ProForm Power 995i is part of the Treadmill test program at Consumer Reports. In our lab tests, Treadmill models like the Power 995i are rated on multiple criteria, such as those listed below. Ergonomics: Ergonomics considers how well the machine accommodates the needs of users and includes belt size, foot-rail design and handgrip design. Construction: Construction considers aspects that impact quality like the motor and related components, running deck and the results of our durability tests. Ease of use: Ease of use considers the ease of using the controls, functions, programs and reading the display. Motor (hp) Motor The manufacturer's continuous horsepower rating. Belt (LxW, in.) Belt The usable exercise surface (deck length x width). All tested models have a belt long enough for walking. Maximum incline (%) Maximum incline The measured maximum incline of the treadmill in percent. Maximum speed (mph) Maximum speed Manufacturer's stated maximum speed in mph. Weight capacity Weight capacity Manufacturer's stated user weight limit for the treadmill. Quick speed controls Quick speed controls Direct entry to set speed levels. Quick incline controls Quick incline controls Direct entry to set incline levels. Chest strap included Chest strap included Shows which machines include a chest strap heart-rate monitor. Heart-rate control programs Heart-rate control programs Automatically varies speed and/or incline to stay in a target heart-rate zone. Reading shelf Reading shelf For holding reading material. Cup holder Cup holder Whether treadmill offers a spot for cups, and how many. Shipping weight Shipping weight Manufacturer's stated shipping weight in pounds (includes packaging unless otherwise noted). NS indicates that neither the gross nor the net weight was available.